Mariah Robertson (b. 1975, California) experiments with chemical treatments in the darkroom to produce genre-defying work. 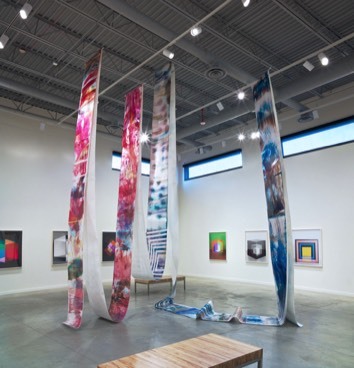 Essentially painting with chemicals on hundred-foot rolls of photo paper, the artist then drapes and folds the paper to create sculptural installations. This monumental new installation was created by the artist for this exhibition. One is not supposed to use glossy paper because it is unsophisticated, bad taste, etc. One cannot have any dings, creases or dents in the photographic paper ("if you want to be taken seriously"). Darkroom materials are made to function only with highly controlled, tiny amounts of light. Chemistry is made to function under tightly controlled temperature conditions. Identifying and inverting various YES or NO points in the operational flow chart led to experiments in pouring very hot and very cold chemistry onto entire rolls of photo paper with the overhead lights on like in a regular room. There is no image, only a record of what has happened to each piece of paper. Mariah Robertson (b. 1975, Indianapolis, IN) received a BA from UC Berkeley and an MFA from Yale University. Her work has been exhibited widely at public and private institutions including the exhibitions What is a Photograph? at the International Center of Photography, New York, A World of Its Own: Photographic Practices in the Studio at the Museum of Modern Art, New York, and Modern Alchemy: Experiments in Photography at The Heckscher Museum of Art, New York. Other exhibitions include Mariah Robertson at the BALTIC Centre for Contemporary Art, UK; Greater New York at MoMA/PS1, New York (catalogue); Mariah Robertson: Let's Change at Grand Arts, Kansas City (booklet) and Out of Focus at the Saatchi Gallery, London (catalogue). Robertson’s work is housed in the collections of the Museum of Modern Art in New York and the Los Angeles County Museum of Art, among others. Robertson is featured in an ongoing documentary for Art 21 titled New York Close Up. The artist lives and works in Brooklyn.